Techniques for joining flex track always seems to trigger long discussions. Much of the discussion concerns how not to end up with rail kinks at the joints, and then turns to the cosmetic problem of the missing ties. While Atlas’ sectional track is designed to easily install rail joiners, flex-track requires ties to be removed to allow the joiners to fit, especially the deeper insulated plastic ones for control or detection. Some modelers cut metal joiners in half, trying to keep the last flex-track tie (and usually ending up with a kink there later). Others try to use an X-Acto knife to carve room under the rails for the joiners in the last tie (and trying not to carve your fingers in the process – blood does turn a rusty brown color with time, but is not my idea of weathering track). Most cut off the ties in the way, make the joint, and later slide one or two ties (sanded down in thickness so it fits) under the rail and joiners before ballasting. Here’s a typical joint between flex-track (on the left) and sectional track (on right). A tie has been removed from the flex-track to allow room for the insulated rail joiners. Note that a hole was drilled in the last flex-track tie and a track nail added to ensure alignment. The missing tie will need to be added back before ballasting. 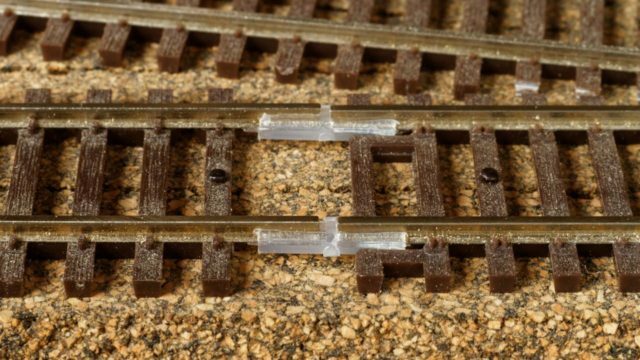 Atlas now has a different way to finish your HO scale code 83 flex-track ends. 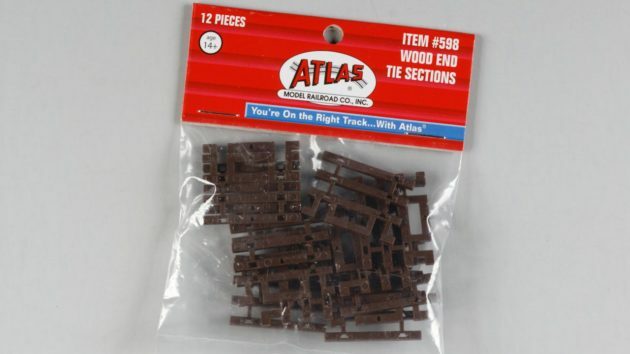 Atlas #598 “Wood End Tie Sections” (also available for “concrete” flex-track for modern modelers) slide on the end of the flex-track after 3/4″ of ties have been removed (4 ties). It uses the same end tie design as sectional track to easily install full-length metal or insulated rail joiners without the need to replace missing ties later. They retail $3.95 for a package of twelve. I ordered mine from an online hobby shop. 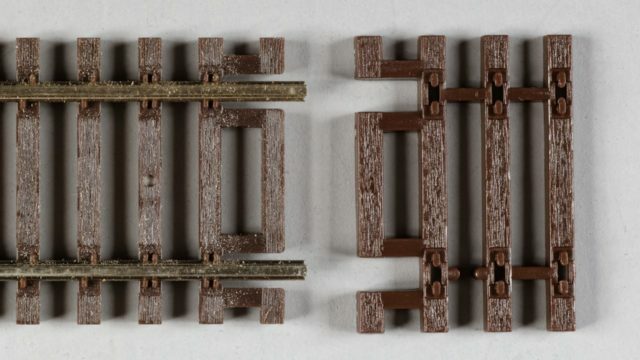 Comparison of sectional track and an Atlas #598 wood end tie section. This is HO scale code 83 track. Hand Laid Rail ... It Can Be Done!